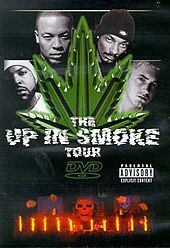 The Up in Smoke Tour was a West Coast hip hop tour in 2000 which was headlined by Dr. Dre & Snoop Dogg, also featuring artists Ice Cube, Eminem, Proof, Nate Dogg, Kurupt, D12, MC Ren, Westside Connection, Chilldrin of da Ghetto, Mel-Man, Tha Eastsidaz, Doggy's Angels, Devin The Dude, Warren G, Crucial Conflict, TQ, Truth Hurts, Xzibit, The D.O.C., Hittman, and Six-Two. The tour was originally called The Boyz in the Hood under the pretext of Dr. Dre's to-be-released collaborative album The Chronic 2000 (later renamed). In September 1999, Snoop Dogg stated that he, Dr. Dre, Eminem, Xzibit, Warren G and Nate Dogg would form the line-up. By April 2000, Ice Cube was on board as part of the tour, which was slated for a June 15 start in San Diego. MC Ren, one time MC of N.W.A, was expected to join the tour in order to have reunited version of N.W.A along with Dr. Dre, Ice Cube, and Snoop Dogg. Come May, the tour was officially known as the Up In Smoke Tour, and Dr. Dre was promising fans "It's gonna be incredible. We're gonna give everybody that's been buying our records a real show, something they've never seen before." By June, the month which the tour began in, plans were finalised with Kurupt joining the tour. It was decided that he would start the opening set, which would be followed by Warren G and Xzibit, then Ice Cube would take the third spot whilst Eminem would take the fourth set. Dr. Dre would be the final set with collaborations including Snoop Dogg and the N.W.A reunion taking place during this segment. Ghostwriter and N.W.A affiliate The D.O.C. appeared on stage with Dre and Snoop Dogg on July 20, 2000 at The Centrum in Worcester, Massachusetts, when they performed the intro to "Let Me Ride" and "Still D.R.E.". Also, surprise guests were promised during various shows. In October 2009, Aftermath Entertainment artist Bishop Lamont said to expect another Up in Smoke Tour when Dr. Dre's studio album, Detox was released. Expected to tour were: G-Unit, Eminem, Snoop Dogg and other Aftermath artists. However, with the cancellation of Detox, another Up in Smoke Tour is unconfirmed. In 2015 Dr. Dre hinted to a European tour similar to the Up in Smoke Tour, wanting to call it the Beats & Rhymes tour. Potential guests for the tour, according to Dr. Dre, would be Kendrick Lamar, Eminem and Snoop Dogg. A year later Snoop Dogg confirmed that the tour is still in the works. "The Pledge (Insert) from Westside Connection"
"Boyz-N-The Hood – Eazy-E (Tribute)"
"Still Not a Player – Big Pun (Tribute)"
"One More Chance / Stay With Me (Remix) – The Notorious B.I.G. (Tribute)"
"More Bounce to the Ounce – Roger Troutman (Tribute)"
"Hail Mary – Makaveli (Tribute)"
"California Love – 2Pac (Tribute)"
"2 of Amerikaz Most Wanted – 2Pac (Tribute)"
"Bust One Fa Ya – Devin The Dude"
^ "Dr. Dre Says He Wants to Tour Europe With Kendrick Lamar, Eminem, Snoop Dogg - Pitchfork". pitchfork.com. ^ "Snoop Dogg Says That Epic Tour With Dr. Dre, Eminem and Kendrick Lamar Is Coming Together". Complex. ^ "Tour a show of rap unity". ^ "French video certifications – Various – Up in Smoke Tour" (in French). Syndicat National de l'Édition Phonographique. ^ "Gold-/Platin-Datenbank (Diverse; 'Up in Smoke Tour')" (in German). Bundesverband Musikindustrie. ^ "American video certifications – Various – Up in Smoke Tour". Recording Industry Association of America. If necessary, click Advanced, then click Format, then select Video Longform, then click SEARCH.